In those days there was the Emperor, who was called the Lord of Ten Thousand Years, who ruled by the Mandate of Heaven from the Dragon Throne in the Great Within in the Forbidden City in Peking, and China was called Chung- kuo which means Central Country, the Hub of the Universe, the Celestial Kingdom and all other peoples were outer Barbarians, Foreign Devils. And voyages of discovery and emigration were forbidden, because there was surely no suitable food in Barbarian lands, only roots and insects and no silver, and supplying emigrants with these things would cause a drain on the Celestial economy; and it was forbidden to trade with the Barbarians, there being nothing the Celestial Kingdom wanted of them anyway, having everything already in abundance. But the Barbarians of the English East India Company, and the Dutch and the Russians and the Americans wanted tea and silk, and there was one thing the Barbarians taught the Celestial people to want of them, and that was opium. For a hundred years the forbidden opium trade went on from Canton, on the River Pearl, with everybody getting their squeeze in the Chinese way, until it became a severe squeeze on the Celestial economy and finally the Emperor appointed Commissioner Lin to stamp out the trade in opium and teach the Barbarians to heed the Vermilion Decrees and to ‘tremble and obey.’ And Commissioner Lin held the Barbarians in Canton to ransom for twenty thousand chests of opium which they had in their godowns, and they did tremble, but it was in rage. Trembling with rage the Barbarians retreated in their clipper ships from Canton to the nearby virgin island called Heung Keung and resolved to wage war to get their twenty thousand chests (and faces) back, and to blast open the wall of China to their trade. Meanwhile, Commissioner Lin wanted the Barbarians to come back to Canton for other trade, so he sent some junks to stop them getting fresh water on Heung Keung, and the Barbarians gave them two broadsides and blew the junks-o’-war clean out the China Sea. And sixteen British Men-O’-War sailed from Calcutta, and up the Pei-ho River to the very Heavenly Gates of Peking, demanding trade treaties for Queen Victoria and the twenty thousand chests of opium back. The astonished Lord of Ten Thousand Years appointed Kishen to seduce the Barbarians back to Canton, there to weary them with negotiations while assembling more celestial warriors to subdue them. But when Captain Elliot got weary of the negotiations he threatened to blow Canton clean out of the Central Kingdom unless he got the twenty thousand chests of opium back, plus the island of Heung Keung as a colony for Queen Victoria. And thus the harlot harbour of Hong Kong was born on twenty thousand chests of opium, a face to launch a thousand ships. After the Opium War there followed many Unequal Treaties, and there were many foreign settlements, particularly Shanghai, and they all bled China white. 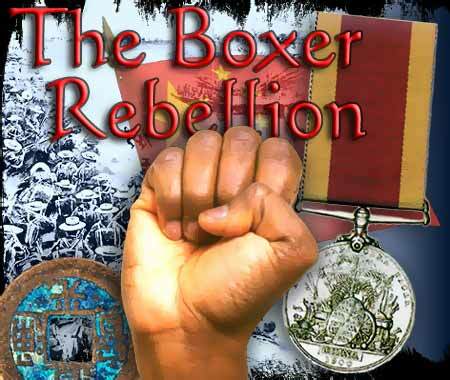 Then there was the Boxer Revolution, the rebellion of the Society of Harmonious Fists, to drive the Barbarians back into the sea, and the foreign legations in Peking were besieged and bombarded for fifty-five days before the combined foreign armies crushed the Boxers; and the Foreign Devils extracted further Unequal Treaties and concessions and imposed heavy war indemnities, and to ensure the payment they seized control of China’s customs, railways and communications, and levied heavy duties to protect their own products manufactured by sweated Chinese labour; and because of these things there was little capitalism for the Chinese in China, no prosperous middle class came about, only millions of coolies and feudal peasants and a few comprador-middlemen and corrupt Chinese imperial officials, and warlords; and China was bled whiter. from - John Gordon Davis' "The Years Of The Hungry Tiger"
Although troops of several European nations combined strongly to put down ‘the Boxers’, Britain, already heavily committed in South Africa, clearly needed help. ‘We’re with you!’ said the Australian Colonies, for Australia was not a Federated country at this stage in history but still a group of British Colonies, and they combined to send to China a Naval Brigade which would otherwise have been despatched to Cape Town to serve in another British war against the Boers. Australia's contribution consisted of Naval Brigades from New South Wales, Victoria and South Australia. 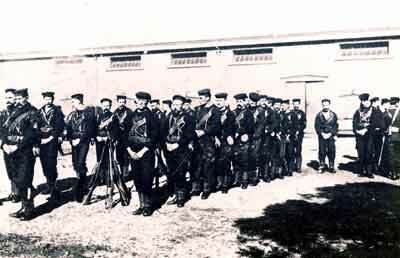 Men of the NSW Naval Brigade - China 1900. The China-bound naval contingent left Sydney on 8 August 1900 with an impressive public send off. Ladies waved lace handkerchiefs and brass bands played. The contingents from New South Wales and Victoria travelled together on the liner Salamis to Hong Kong and from there on to Shanghai, China. The Victorian Naval Brigade of over 200 officers and seamen comprised part of the Port Melbourne Naval and Williamstown Naval Brigades, as well as officers and men from the Victorian Navy. The Victorian Naval Brigade was commanded by Captain F. W. Tickell. They sailed in the wake of three British warships from the Australian station, the Wallaroo, the Mohawk and the Lizard. South Australia sent its contingent of ninety-six officers and men via the 920-ton ship, PROTECTOR offering it for service to the British Admiralty for the China campaign. It was, wrote Lieutenant-Commander J. Gill, an officer onboard, probably the first ship ever to leave Australian waters for war manned by an all-Australian crew. 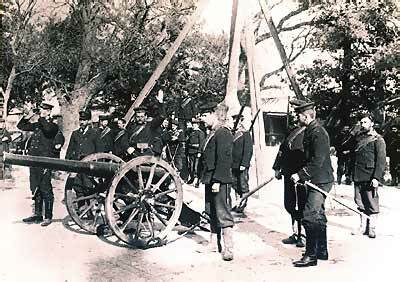 When they got to Hong Kong on 26 August the main contingent became attached to the ‘British Field Force in China’. In the months ahead the men did not see a great deal of fighting but they witnessed many massacres, hideous atrocities, unrest, rioting and cruelty from all sides. Fortunately casualties were light and only six men lost their lives. On 25 April 1901 the force arrived home in Sydney. *The medal in the title image is 'The China Medal' awarded to memebrs of the NSW and Victorian Naval Brigades and the crew of the South Australian Gun Boat 'PROTECTOR' for service in the 'Third China War', otherwise known as the Boxer Rebellion - Number of medals issued - NSW 257, Victoria 198, South Australia 98, Queensland 1.